The youngster came through, beating both Novak Djokovic and Roger Federer, world Nos 1 and 3 respectively, in straight sets on the way to his first major title. Zverev, a lanky 1.98m with shaggy hair, mafia-style gold chains (how on earth does he play in those?) and lopsided grin has finally come of age. 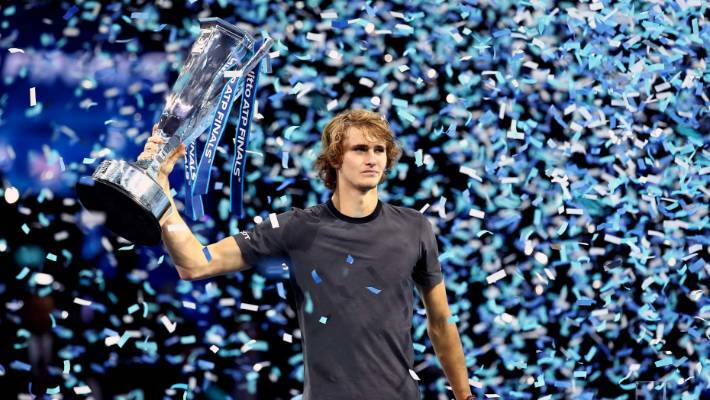 Alexander Zverev slumps to the court after beating Novak Djokovic of Serbia in their ATP World Tour Finals singles final. He hasn’t gone further than quarterfinals in the slams but might this be the start of something big? The result in the final was a surprise. He had lost to Djokovic in straight sets in the round robin and his opponent hadn’t had his service broken in the event up until their match. 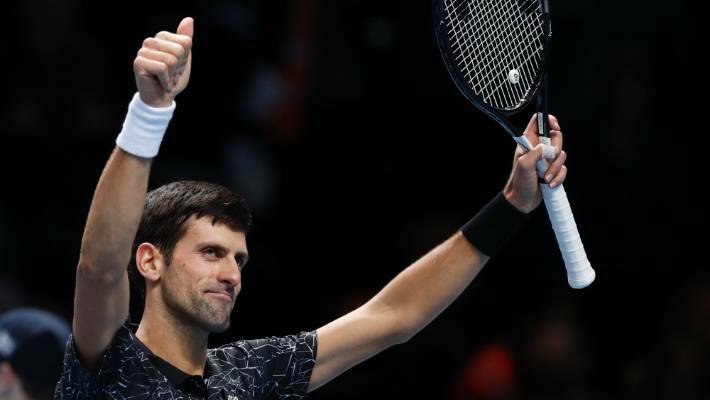 World No 1 Novak Djokovic celebrates after beating Alexander Zverev in round robin play. Up until the final, Djokovic looked to be unbeatable, a baseline brick wall sniffing out the openings and usually closing out the points with ease. Incredibly, Zverev outplayed the Serb from the baseline, matching him for patience and retrieving and beating him in the power area. The German is 10 years younger than Djokovic, a lifetime in tennis, and it showed. Gruelling rallies, after which he looked fresh and unconcerned, casually sauntering round the court, while his opponent was breathing heavily, crouching to the ground to catch his breath. 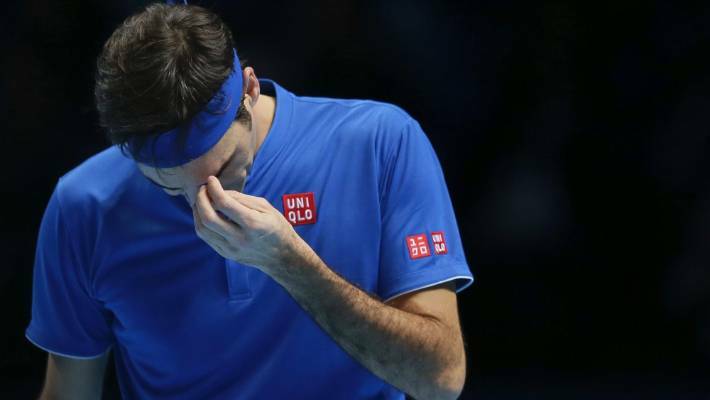 Roger Federer of Switzerland looks dejected after losing a point to Alexander Zverev. Djokovic played for time, bouncing the ball before his service even more than usual – I counted an average of 11 bounces, frequently hitting the 15 mark. It must drive his opponents crazy. He averaged 28 seconds between points but received no warning; there appears to be little consistency among umpires in regard to this. And Federer is also beginning to look fragile these days, frequently inconsistent and grouchy. Nadal, Federer and Djokovic are all in their 30s; not so long ago, an age where players had already hung up their rackets. Of course, these top three, who have taken the last eight grand slam titles between them, are ever popular but looks as though the younger players are finally breathing down their necks, hungry to take over. Meanwhile, the 20-year-old Greek, Stefanos Tsitsipas took the Next Gen title in Milan in November. At 23 years-old, the brilliant but inconsistent and moody Aussie Nick Krygios may well have missed the boat unless he manages to get his act together, which seems unlikely. This looks to be the new age of not just Zverev, but also Dominic Thiem, with Tsitsipas, Alex de Minaur, Hyeon Chung and others nipping at their heels. It’s about time and it’s exciting for the future of the sport. rrently on 99. It seems unlikely he’ll retire before he reaches the magic figure and bows out to the youngsters.